Island of Dr. 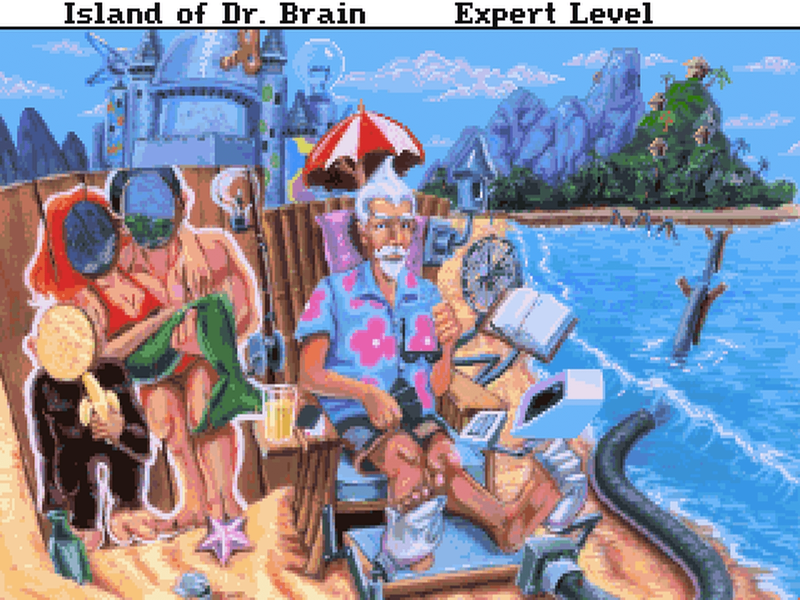 Brain – Won! Easy if you can read a treble clef. In the far corner of the room, I find a piano, which launches the music puzzle. This has three stages. 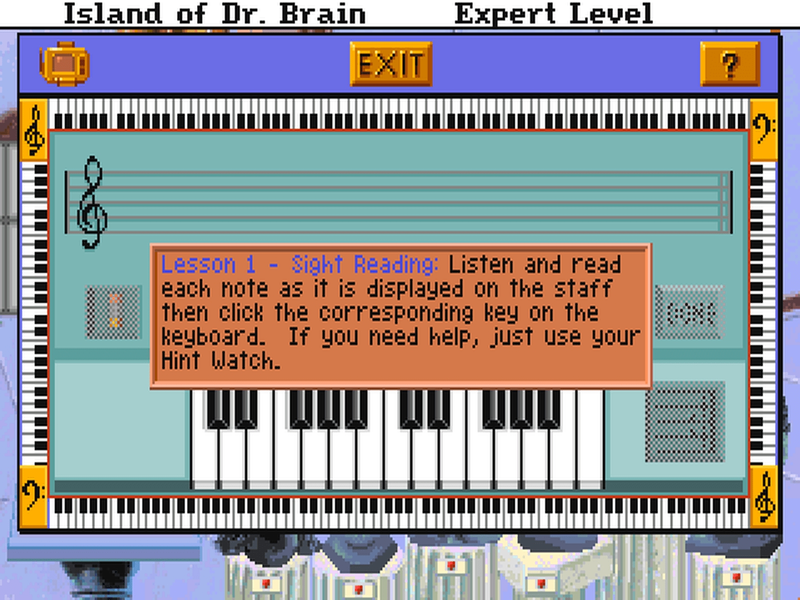 “Lesson 1” is Sight Reading: clicking the correct note on the piano that matches each note on the staff. 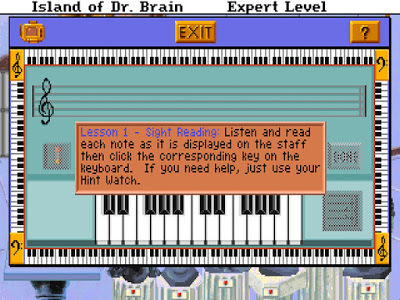 Lesson 2 is Placing Notes: clicking the correct place on the staff that matches each note played on the piano, which is just the inverse of sight reading. Lesson 3 is Memorize the Tune, which is a bit harder than the first two. A melody is played while it appears on the staff, then it disappears, and I have to recreate the notes on the staff by memory, either ear or visual memory. But I can do a few notes at a time and then replay the melody as needed, so it’s not really all that difficult, just a bit tedious. I could have even used the above screenshot, but I didn’t look at it until after I’d already cleared the puzzle. I should probably clarify that I do have some musical training but I’m not particularly skilled at either reading or playing music: I just sing in choir. As long as you can read a treble clef, understand note lengths and what sharps and flats are for, you can do this puzzle. It’s a precursor to the rather more difficult music puzzle in Lost Mind of Dr. Brain, which at higher levels requires the player to be able to read music well enough to be able to assemble a selection from measures that may have been transposed or flipped horizontally or vertically. 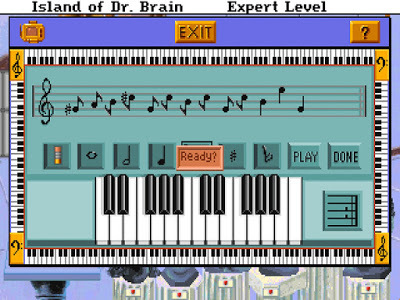 Once the puzzle is complete, which of course gives the Music Theory plaque, the game offers a free play option where you can plink around on the keyboard or put notes on the staff and have the game play the constructed melody. That’s a neat option. 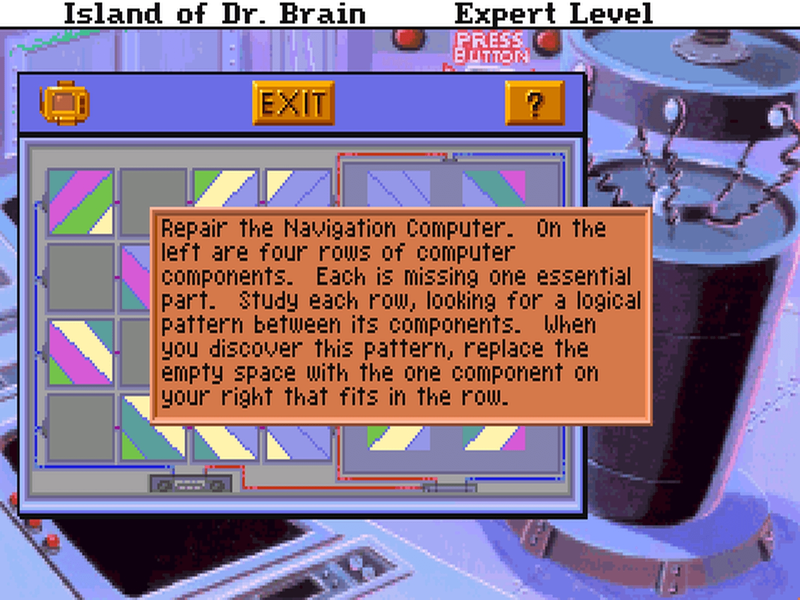 I don’t think any of the other puzzles have offered a free play option outside of redoing the actual puzzle. This whole island has an engine?? The final room shakes when I enter it (every time even, if I go back and re-enter the room). Dr. 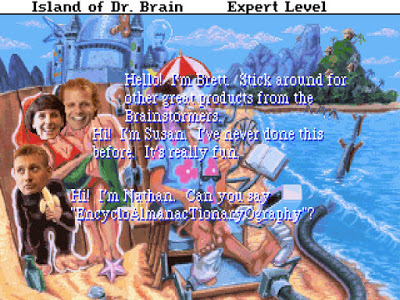 Brain congratulates me on getting to the battery. But we’re not quite done yet. This room seems to be the control center of the island. I can’t do anything with the consoles right away, but there’s a large button on one wall with an obvious label: “Press Button”. Well, okay then. That pops open one console, which looks like it isn’t working properly. 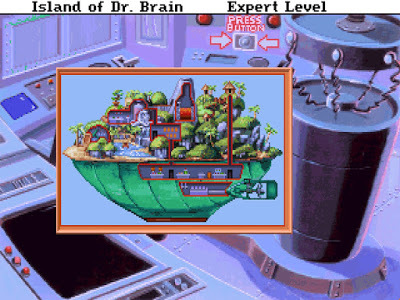 I also notice another panel that displays a map of the island, including what looks like some kind of engine attached to the back. Wow, what a convoluted place. You can see representations of the various rooms we’ve traveled through to get to the control center at the bottom. The squares are supposed to represent some kind of computer chip or board, I guess. 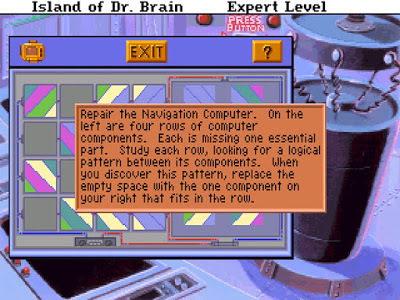 So next I have to repair the Navigation Computer by filling in gaps in the patterns of various kinds of computer components. One time I was given squares with various diagonal lines; another time they looked more like resistors with colored bands. Completing the four rows solves the puzzle and gives me the Visual Series plaque. Then the game (not Dr. Brain’s voice, just a game message) instructs me to “Throw the lever forward.” Now that the computer is fixed, I can do that, but now I’m in danger because the volcano pressure has increased too much. When I push the lever forward, I’ve set the throttle to full (does this whole island move? ), but the “Volcano Stack Computer” is broken. Something flies out of it, and an alarm goes off. 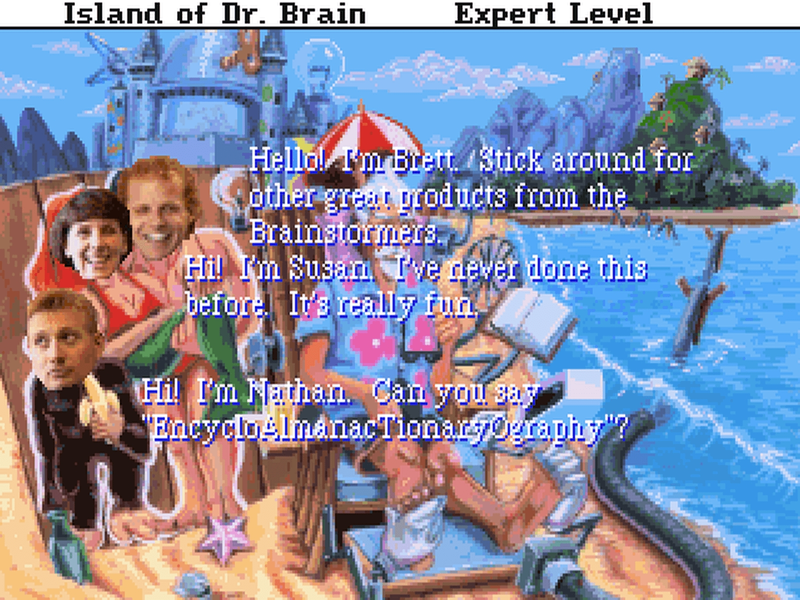 Leave it to Dr. 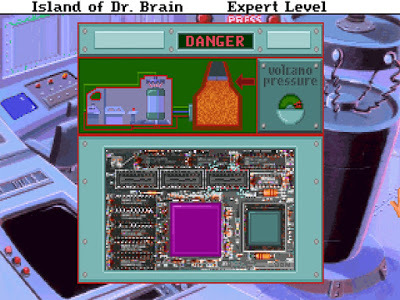 Brain to mess with volcanoes. I click on it, and I’m given a schematic of the computer with one component damaged and sparking. I click on that to remove it, and then I have to put it into the reprogrammer by solving the “Transistor Logic” puzzle. I have to test the old chip to determine its logic pattern and then program a new chip to replace it. 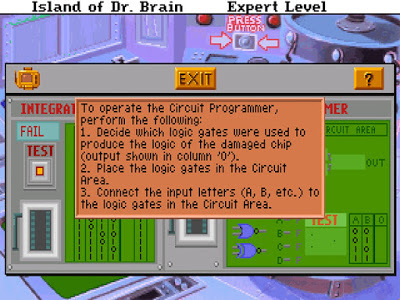 The program is constructed using classic logic gates: AND, OR, NAND, NOR, XOR, etc. I have to construct a gate combination that will give a specified output pattern using up to four inputs. This can get kind of complex, actually, especially if I have to use three gates. Instructions for the circuit programmer. In the particular pattern I get, I notice that only two of the inputs actually have any effect on the output. If D is 0, then then output is the inverse of B, but if D is 1, then the output is 1 (or D). Since AND has the effect of outputting 0 if both inputs are 0, and 1 otherwise, I can simply construct the gate combination that can be represented as “D AND NOT B”. A and C make no difference. 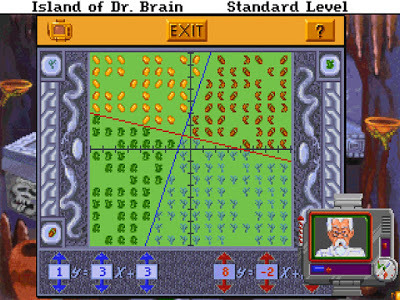 This gives me the “Logic Gates” plaque and also allows me to win the game. Before I describe the ending, I’m going to go back through the game from the beginning and revisit each of the puzzles to see what the differences are on the easier difficulty levels. You can always go back and redo earlier puzzles, which gives you more hint calls if you need them, and doing the puzzles again on multiple difficulty levels also adds bonus points. Microscope puzzle on Standard: just lines. Polyominoes: Doesn’t appear to be any different on different difficulty levels. It’s always a 6×8 rectangle with about a dozen pieces that must be fit inside. It’s possible that “easier” configurations are selected on the easier difficulties, but having completed the puzzle at least once at each level, I didn’t notice much difference. Microscope: Decidedly easier. On Novice, the equations are both just perpendicular straight lines, one for the y-coordinate and one for the x-coordinate, which is trivial to solve. On Standard, both equations are linear with slope and offset factors. And, of course, on Expert, one of the equations was a parabola. Sarcophagus Lock: Also easier. On Novice, there are only three very simple numerical sequences, and on Standard, there are four mostly simple sequences. 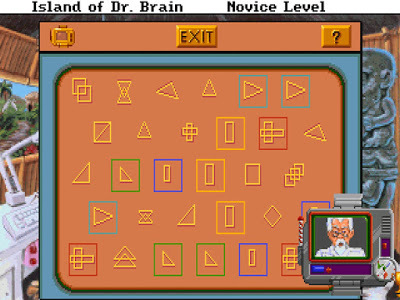 On Expert there were six, and some sequences involved squares or varying patterns. Towers of Hanoi: Requires moving four rings on Novice (which is just barely harder than three, really), five rings on Standard, and seven rings on Expert. So the Expert solution takes more than eight times as long as the Novice solution, and four times as long as on Standard. That last twisty gray area is just one puzzle piece on Novice. Jigsaw: The Novice level breaks the puzzle up into much larger pieces, so there are far fewer of them and the puzzle is far quicker to solve. I think it took me not much more than two minutes. On the Standard level, the pieces are the same size as on Expert, but the whole outside border is already done. This cut the solving time down by about a quarter for me, so I solved it in about fifteen minutes compared to twenty for the full puzzle. Blinking Flamingoes: Made trivial on Novice by only having to set one flamingo, and while Standard requires two, it’s still a lot simpler than Expert’s three. Word Search: Generated exactly the same way each time, with twenty foreign words hidden in the grid, but on Standard, only fifteen of the twenty need to be found, and on Novice, only ten. All twenty can still be found after completing the required number, but nothing extra happens if you do. Cipher Bridge: Noticeably simpler on Standard: the quotes are shorter, and the scrambles are easier. Both word and sentence anagrams are used. On Novice, it gets even easier: no word anagrams are used, only scrambled sentences and misplaced spaces. 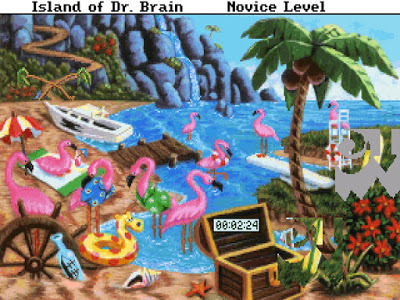 Botanical Garden: Same background image on each level, but only 12 animals need to be found on Standard, and only 8 on Novice. Honestly, the Novice level puzzle I played ended up being harder than the Standard because there were three tiny ant lions, two very close to each other. I don’t think there’s any reason why there should be even two of the same animal in any given puzzle, even on Expert, but especially on Novice. In the several times I played it, I saw at least twenty-five different animals. It’s really not that hard to make an algorithm that doesn’t repeat items from a list. 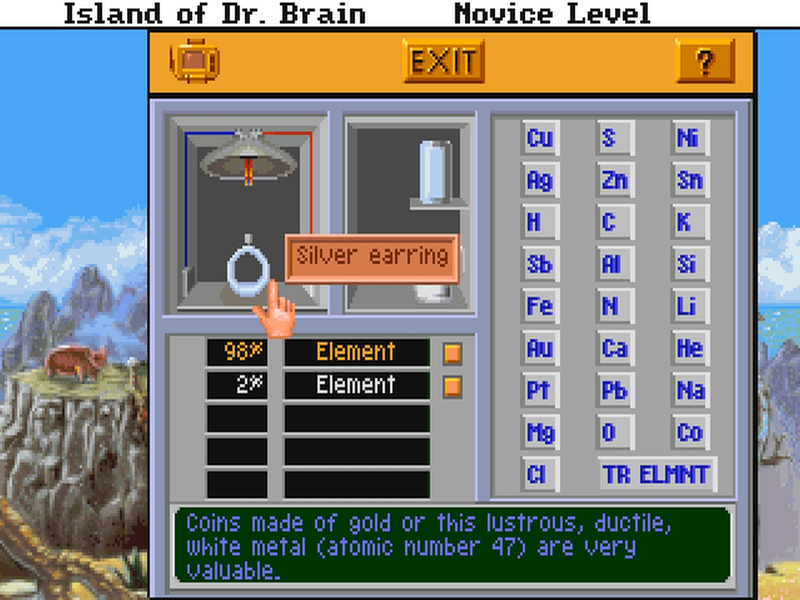 Novice level tells you outright what the element is. Element Analysis: You may remember that on Expert, this involved analyzing objects that were comprised of three elements (plus trace elements). 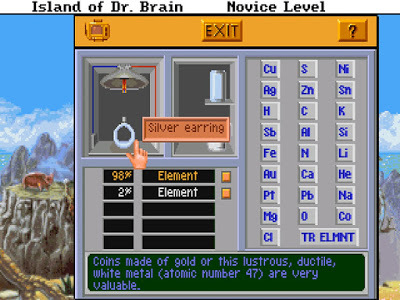 Well, on Standard, the objects only have two major elements, like a brass knob (copper + tin), and on Novice, the objects only have one element, and it’s usually named in the description of the object, like a silver earring. You just have to know the abbreviation, or you have to click the elements until you find it, that’s all. Numeric Planning: Expert and Standard levels both use a 4×4 grid, so I’m not really sure how the Standard one was easier, but it was. 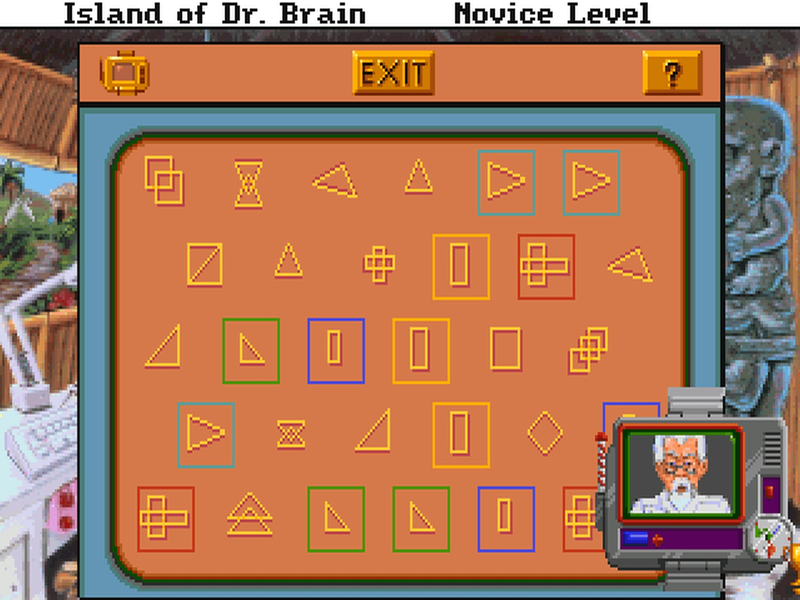 The Novice level uses only a 3×3 grid, so it’s much quicker to guess and check options. Spectrum Analyzer: The Expert level pattern involves six elements; on Standard it’s five; and on Novice it’s only three. I approach it the same way no matter how many there are, though: I test each individually and then combine the ones that match. Antonym Anthill: Always asks two sets of three quotes, but on Novice, each quote has just one word that needs replacing. Standard has two words, and Expert has three. The lower levels also indicate when a particular quote has all words correct; I don’t think Expert did that. Synonyms and Homonyms: Similar (ha), with two words per sentence on Novice and three words on Standard. On the synonym puzzle, the Novice level is particularly simple because only the rhyming words at the end need to be replaced. Object Matching: On Expert, the objects were rather detailed masks with a lot of different but similar features. Standard has silhouettes of creatures that still have several different features, but not as many as on Expert. Novice just uses geometric shapes, which are a lot easier to match, of course. 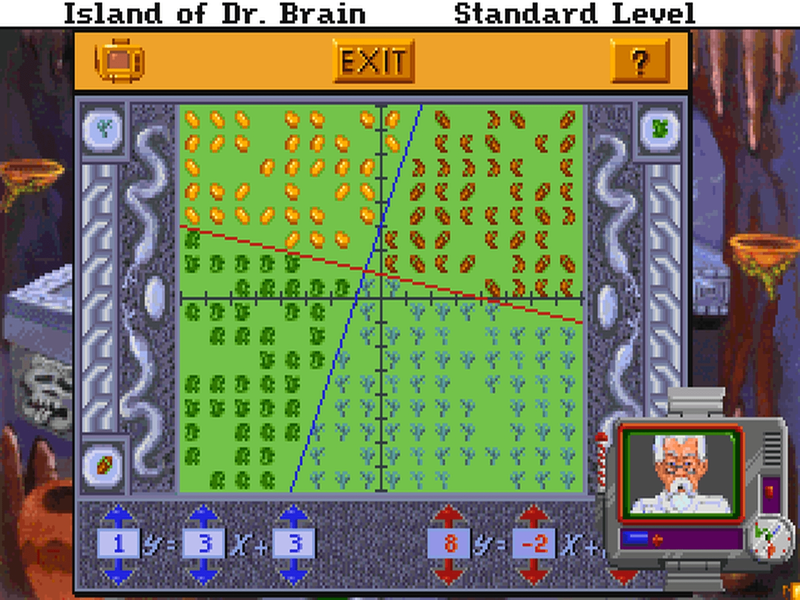 Each level still requires five sets. Bookshelf: Standard asks the player to sort books, four per shelf, about various geographical features into categories like mountains and rivers. The Novice puzzle asks the player to sort books, three per shelf, about various instruments into categories like woodwinds and percussion. Counterweight: Even on Standard, I found this to be the hardest puzzle in the game. Maybe I just need better mental math? Novice separated the liquids into different divisions of the bucket, and it also automatically determined which division of the bucket to pour into, but you still have to do the math to figure out how many of each size container will add up to the given total. Elevator: Even on Expert this puzzle was sometimes trivial if the ratio was a whole number, so this puzzle didn’t differ much. Robot Programming: As far as I can tell, it’s pretty much the same on all levels. The three cartridges themselves have three levels of difficulty, but you have to use all three anyway. Genetics: On Standard, the combinations are simpler: I think all of the grandparents start with pure sets (AA or aa) of all the genes, rather than possible mixes. On Novice, there’s only one generation: the player must simply cross two creatures to get the right final mix among the children. Art Concentration: Standard only requires identifying two of the three rows of paintings, so there are more examples already identified for comparison, and Novice only requires identifying one row of paintings. Music: Fairly similar on all levels, but the selections of music are a bit shorter on the easier levels. Plus on Novice, the game chooses the correct length of note for you. Visual Series: Novice and Standard generally offer more obvious series, such as a sequence of bands that rotates one place each square, but otherwise the puzzle is exactly the same. I played a couple different times, and one time on Standard I got a puzzle with colored dots that was inscrutable to me. It’s easy to shift back and forth between difficulties and generate a new puzzle, though. 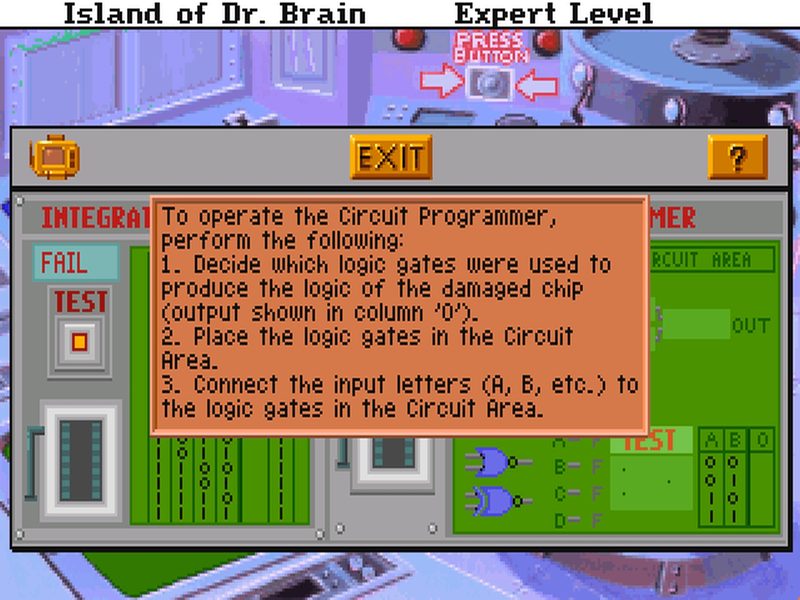 Logic Gates: Only uses three inputs on Standard, compared to four on Expert. Only two on Novice, which is more or less trivial because the test area at the bottom will display the truth table for any single gate. Still, for anyone that doesn’t understand logic gates at all, Novice is a good place to start. After I finish the logic gates puzzle, that fixes the computer at the heart of the island. The view cuts away to a side view of the island, which shows a huge engine attached to one end. 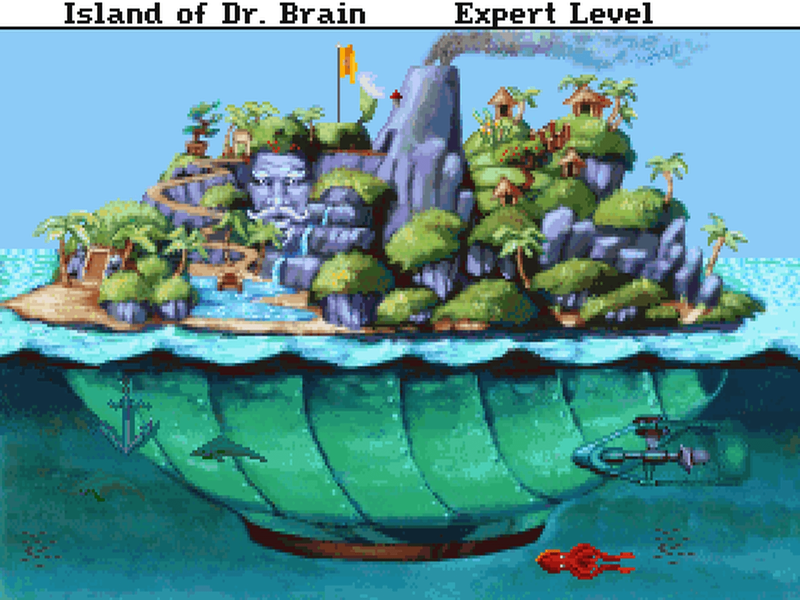 The engine starts running, which pushes the whole island. It’s turned into a ship! The anchor is raised, and a flag emerges from one of the hills. Then the view zooms way out to the map from the very beginning with the copy-protection “puzzle,” where we see the island-ship moving around until it arrives at Dr. Brain’s castle in one corner. There I see Dr. Brain lounging in his latest invention: a comfy lounge chair complete with fancy drink-holder, foot massagers, a fan, a book holder, and other amenities. He sent me off to get a battery to run this thing?? I guess it must use a lot of power to run all the automatic gadgets attached. Full score for completing the game after doing each puzzle once with no hints. Dr. 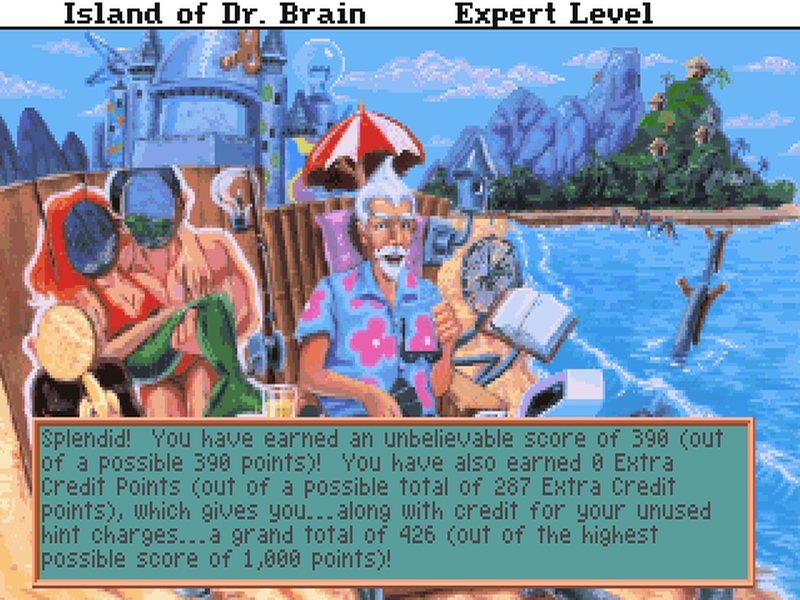 Brain congratulates me on my score (calling it “unbelievable” since I scored full points). 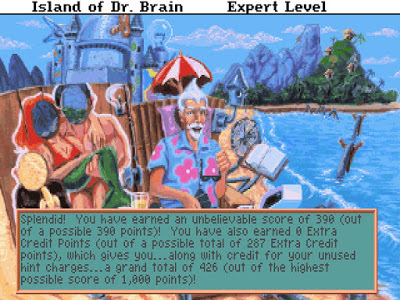 The maximum total score is 1000 points, but only 390 of those come from completing the game: the rest come from replaying the puzzles on multiple difficulties and from not using hints. Then the credits roll, complete with little animated heads and comments from the staff. Actually, these aren’t real credits since they don’t give full names, just whatever name is given in the comment, which is usually just first name. 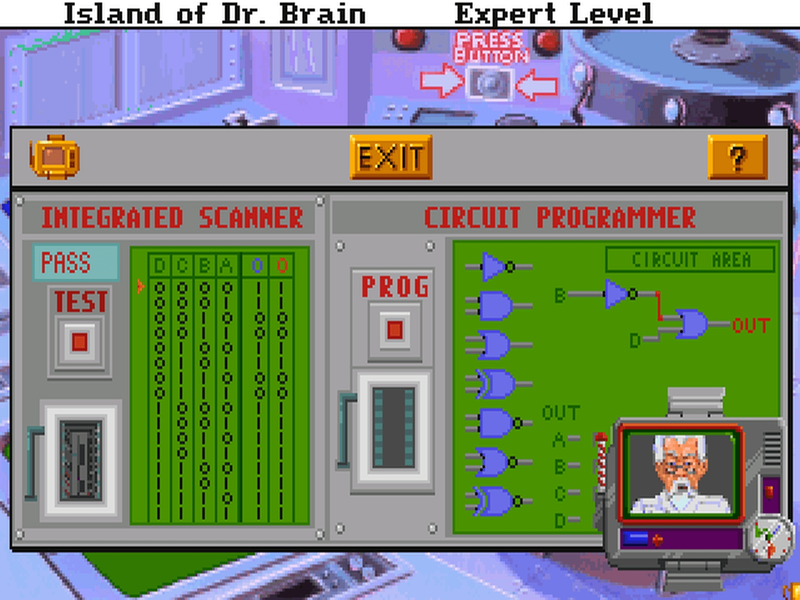 After the credits finish, the game gives the option to go back and keep playing puzzles, replay the credits, or quit. Brett is probably Brett Miller, for instance. And that’s Island of Dr. 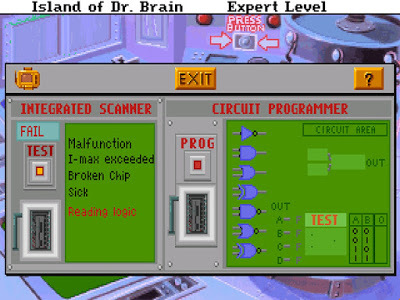 Brain! Puzzly fun for the whole family! Next time we’ll take a look at how it stacks up. PREVIOUS POST Previous post: LGR’s Obligatory 2018 Year-End Extravaganza!